These are so satisfying and delicious. 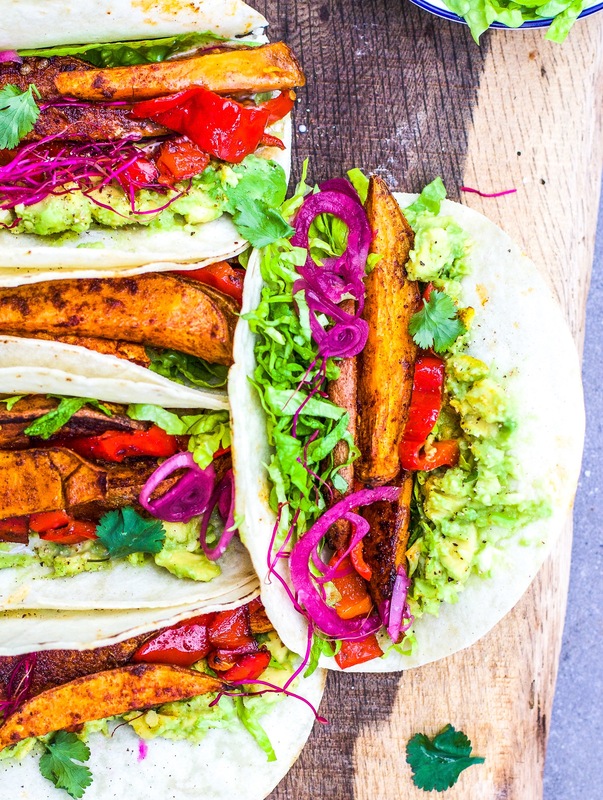 The spiced sweet potatoes and roasted peppers make an amazing main filling, it’s the best with the creamy guacamole. Add in any other extras you love, my favourites are listed. Chop the sweet potatoes into chunky wedges and lay them out on a roasting tray. Sprinkle over all of the spices and a good pinch of sea salt. Drizzle over 1 tablespoon of olive oil ands your hands to mix it all around. Pop them in the oven for about 40 minutes until tender. Cut the peppers into thin strips. When the wedges have been in for about 25 minutes, add the peppers and the remaining tablespoon of olive oil and toss well. Return them to the oven for the remaining 15 minutes. While they’re cooking, make the guac. Finely chop the garlic and add it to a bowl with the avocado, lime juice and a good pinch of sea salt and pepper. Mash it to your liking with a fork. 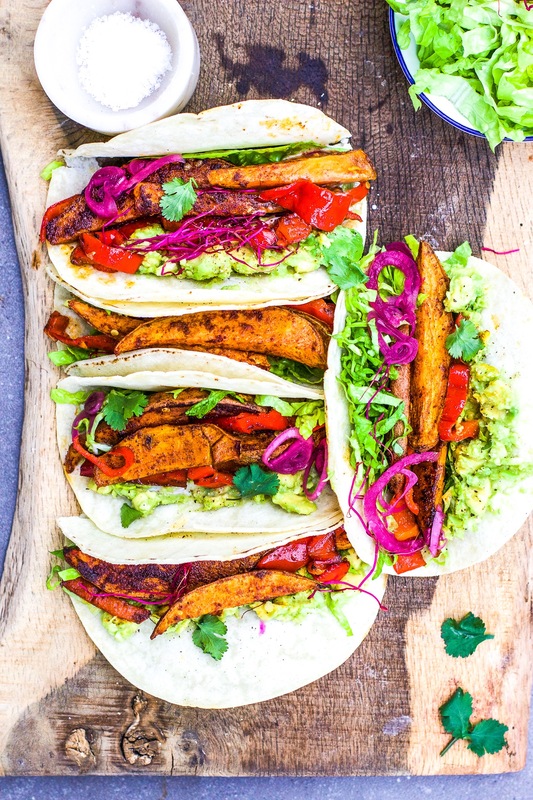 Fill your tortillas with guacamole, the roasted sweet potatoes and pepper and any extras you’d like. I use corn tortillas and add in crunchy lettuce, pickled onions and tobasco. This looks amazing! I recently read that sweet potatoes are actually a root plant, not a “regular potato”. That it’s a super food. Thank you so much! OMG – these were delicious and so quick to make. The seasoning on the sweet potato was just perfect. I cut my sweet potato on the thinner side as I was limited on time and it was on the table in 30 minutes I used some radish and fresh jalapeño too. My husband and I put these straight onto our “regular” list. Thanks for sharing!